Want to reduce aches and pains, tension and stress while improving your flexibility, posture and overall well-being? Looking for a deep-massage without having to spend a lot of money? Look no further than MELT Performance Roller. MELT Performance Roller massages and hydrates the fascia, the deep multi-dimensional tissue that connects muscle to bone and organs. Massaging and hydrating the fascia can improve range of motion, flexibility, circulation, core strength, and joint stability. It is a fantastic tool for people of all ages. Athletes and young people seeking a fit, healthy mind and body as well as older people looking to maintain mobility can all benefit. MELT is ideal for pre-workout self-treatments to improve performance, it is also great for post-workouts to reduce aches and recovery time. MELT allows you to reach your fitness goals without fear of injury. 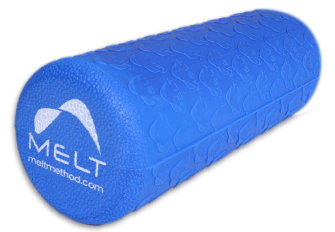 If you’re an athlete, someone looking for a good self-massage, or an older person looking to maintain flexibility and range of motion, the MELT Performance Roller can help! Tell us in the comment section below this post (not on the Facebook site) why you are excited to receive a MELT Performance Roller. As an aging distance runner my body stays sore longer after intense workouts/races and a MELT Performance Roller would help get me on the road quicker doing what I love. This wonderful roller would give me comfort when my back is stiff and sore. Thanks. I frequently use the foam rollers at my gym to ease the muscle strain from exercising. Having the MELT roller at home would be a wonderful addition to my gear! I would love to give this to my Mom, she could easily use this and keep her moving easier! I’m a nurse, I’m always sore after a 12+ hr shift. This would be amazing! At 71 I have aches and pains. Roll away would work well for me. My rheumatologist just recommended I try this for fibromyalgia pain. I would be very excited to win this! Oh my gosh my back needs this TODAY! I would give this to my boyfriend. He just started running and is having IT band tightness. He foam rolls at my house but I know he’d love to have his own roller. I could totally use this roller! I just started Orange Theory and my legs are SO sore. I’d love to have one. I am excited to get this roller because it would help my bad Back.Thanks. I would love to win this roller! I have had trouble with pain in my leg (diagnosed as ITB syndrome) for several years now and have to take a foam roller with me any time I travel to help cope with the pain. To have a more compact but effective roller would be so much better for travel! I would love this to help with my back tension and IT band tendonitis! Returning to running after 12 weeks with a stress fracture, lots of aches and pains to work out! This would help with physical therapy, would love to win a foam roller! I’m excited about the roller as I know it would come in handy as I train for runs & my first triathlon this year. Helping to ease the sore muscles would certainly aid in a more speedy recovery! This would be wonderful for my lower back, and it would also be great for my husband’s back pain. I would love this to relieve aches and pains and to become more flexible. I have tendonitis and this will be a good tool to help me ease my aches and pains. I stand on my feet most of the day at work. This would be great to have! I’m going to start running again soon, and this would be perfect for post-run cooldowns! I so need this for the pain and tension in my hip. Thanks for the chance. I want to be a “lucky reader!” That is, I’m sooooo excited to receive a MELT Performance Roller because I had a total knee replacement ~ 5 weeks ago. My goal now is to get rid of scar tissue that the body is forming. The MELT Performance Roller can help me along with decreasing the scar tissue, and more! Now, that’s very exciting to me as a post-op patient! Also, my chiropractor highly recommends the MELT Method. OMG this roller I’m sure works amazing from those sore muscles after working out. Especially after those 21 Day Fix workouts! I would love to get a roller to help ease sore muscles after working out. In addition, my husband would benefit from having a roller at home to use. He uses one at physical therapy and having one at home will help with his rehab. I’ve been wanting to get a foam roller for a while to help me with some back and leg pain but I am not sure what size and kind to get. This roller looks like it would be the perfect fit!! I’ve been doing well with my New Year’s Resolution of putting on more muscle. Now that new muscle is aching and I need to take daily care of it! Yoga and Pilates help but melting away my soreness with this foam roller sounds like just what I need. I’ve been looking at foam rollers for quite some time now. Just can’t decide on type or style. I would use it pre workout out to warm up my muscles and after to prevent soreness. I think I could just do a workout with the roller itself too! I would greatly benefit from the MELT Performance Roller to give greater stability on my knee and hip joints- used over my IT Band. My husband would use the Roller for his quads and hamstrings. Would love to show these at our gym and in the fitness classes we teach! I would be so happy to receive the foam roller because I think it would help so much with my fibromyalgia pain. As a Persona Trainer, trying out new type of equipment is always exciting, haha! This roller would be just awesome for me to use and to recommend for my clients as well!! I have always wanted to try a foam roller. My legs hurt after heavy walking. The MELT Performance Roller is just what I need for my constantly stiff & achy back. I spend long hours seated because of the manner in which I work & this would certainly help relieve the tension & the aches. I am new to Yoga and I do not own a MELT Performance Roller. After falling and breaking ribs, the road back to the level of health I had before is long and hard. At physical therapy we use something similar. Would love to have one at home!! I like Appetite for Health of FB! I would LOVE to try out the MELT Performance Roller on my back because I have Scoliosis & always have severe pain in my back on a daily basis. As a health care professional, I have to physically work with people every day which leaves my back in agony every night. So I would absolutely LOVE to try this out!! I would love to use this roller on my back in the morning to be able to stretch for the upcoming day. I want to still keep doing what I am doing and more. This would help me put my back in place in between my activities. I am moving now and so many things to do. I have been a contractor and so much more and this would sure help me out!! Thanks for the chance!! Already liked your facebook page!! I would love to try this for my very tight and achy muscles (especially in my legs and back and neck). I constantly crave massage and pressure, so this sounds great. And my husband is a long distance runner who gets a lot of leg pain, and he could really benefit from this as well. Thanks for the opportunity. There would be no better way for relaxing tight muscles, when you can’t get to a massage therapist. I would love to have this! I have back problems and the would help with my motion, flexibility, circulation, core strength, and joint stability – all of which would help me overall! I have issues with sciatica and hope this roller would help. It just seems like a good way to relieve tension in general. I would love this to soothe my aching back as I stand on my feet over 8+ hours a day working in a busy retail environment! This sounds like a really beneficial cure to roll on every evening to relieve any standing tension and strain. Thank you so much for the review and giveaway and I’m an email subscriber and Facebook fan. I sit at my desk 40 hours a week with TOO little activity time– I would love to ROLL away my ahces and pains with this handy little foam roller!! This would help my back and neck soooo much!! I liked Appetite for Health on Facebook. This would be great to have to help out after a hard day of work to fix my aches and pains. I was born with a curvature of the spine and do yoga to help relieve tension and stretch it out. This sounds wonderful to help assist with it too. I also like you on FB and get your newsletter. Thank you so much! Oh goodness. This was like perfect timing! I just pulled a groin muscle last week while running tight turns. I ran a 10k a few days later and have been using the foam roller at the gym but want to get one for home. I’d love one of these! So many great exercises with them, too. I’m hooked! This would be great to use after lifting at the gym or after chiropractor visits. I don’t have enough curvature in my neck so I think it could also help with that. Sounds great for relieving stress too! I am an avid exerciser and work out 6 days a week lifting heavy and doing High Intensity Interval Training so my muscles get pretty sore. I’ve been wanting a roller like this one but haven’t had the funds to purchase one yet so it would be awesome to win this Melt performance roller cause my muscles need it. I’d love to see if this works on my shoulder because it gets very achy after working. I would appreciate being one of the lucky ones to receive one of these rollers, because I’ve heard some of the awesome benefits of using one of these from my mother for quite some time now, she has one and uses it daily. Unfortunately at this point in my life, our finances don’t leave a lot of money left to buy one due to the fact we have to pay, something nightly upward of $100, for a hotel room. We lost our place to live after my boyfriend lost his job and we werent able to pay the rent on just my income alone. Now were stuck paying an arm and a leg to make sure we have some place to lay our heads every night. Not to mention trying the fact of trying to eat healthy when we dont have a kitchen to prepare, cook or store food in, being stuck with a mini fridge and a microwave as our kitchen. I don’t mean to to share any of this as a sob story and hoping for a pity party, because in spite of my current situation I am grateful to have a roof over my head at the end of the day even if it’s not my own roof, and I don’t go hungry and I have the love of my boyfriend who makes sure im warm and i don’t go hungry. I’ve recently been working at changing the daily choices I make in regards to my health and wellness, incorporating healthier foods (which is hard living in a hotel), and pushing myself to be and hold myself accountable to become more active. I’ve suffered from aches and pains for as long as I can remember despite everything I try. In my attempts to be a healthier and better me, being one of the ones chosen to receive a foam roller I feel would change my life for the better, being unable to afford one on my own i feel i could become more active if i had one of these to utilize in helping rid my aches and pains. I realize this has been long and drawn out but I wanted the opportunity to explain where I am at in my life and why it is I would benefit from being chosen. Thank you for the opportunity and chance to receive something that could help me become a healthier and pain free version of me. I’ve recently been working at changing the daily choices I make in regards to my health and wellness, incorporating healthier foods (which is hard living in a hotel), and pushing myself to be and hold myself accountable to become more active. I’ve suffered from aches and pains for as long as I can remember despite everything I try. In my attempts to be a healthier and better me, being one of the ones chosen to receive a foam roller I feel would change my life for the better, being unable to afford one on my own i feel i could become more active if i had one of these to utilize in helping rid my aches and pains. Sitting at a computer all day leaves my neck, shoulders and lower back screaming for relief. The MELT Performance Roller would be a blessing to win as an to aid to relieving the tension and strain as well as improving my posture and overall wellness and sleep. I have used one of these quite often when I am in Physical Therapy due to a leg injury. This would help me continuing the healling process at home. I am awaiting surgery for a torn meniscus.MELT is the only thing that brings relief to my body. I’d love the new performance roller for travel. I have a frozen shoulder. Been working with therapy and yoga instructor to free it. Its been a year. Finally its working again, not 100% but moving more this year than last. Want to continue to improve. Melt heloed with foot pains last year. I would be sooooo excited to receive a Melt roller!!! My cousin is a holistic healing chiropractor and is certified to teach the Melt method. But, she lives too far away. She swears by the method. I need one to help with chronic arthritis pain and inflamation. Thanks so much for this offering!!! dvd also. So excited to get started. What is the difference between the performance roller and the melt, obviously the size. But is it better for you, or just different? I have a lot of pain, I hope I can start getting some relief. I just had steroid shots in the periformis which made my pain worse. Looking to be pain free. I love going to MELT classes in my area and learning new ways to help me get out of pain. It has helped so much. Melting has changed my life. I am a mom of a 21 y/o special needs daughter who is totally dependent on me. I have suffered from chronic pain for years. And even tho I workout and live a very healthy lifestyle I still struggle with pain. The small roller is going to be perfect for things that you just can’t to with the long roller. I can’t wait to throw my old style short foam rollers away. After multiple surgeries and plenty of scar tissue, I find that more than anything the adhesions have created just as much pain as the surgery itself. My physical therapist has show how massaging the soft tissue helps to break this up. By having this roller I could accomplish this by myself and keep my tissues stretched. The performance roller, like its predecessor, the regular MELT roller, is rife with defects! Many of these rollers simply collapse in the middle, and the quality has not improved – despite many promises – over the last 3 years. I noticed the trainers use rollers all the time at the gym. When I have used them, it really seemed to smooth anyway tension in the muscles. As I have gotten older I have seen not only in myself but friends as well our balance has at time become an issue. If I fall it could limit my activities. Balance exercises, along with certain strength exercises, can help prevent falls by improving my ability to control and maintain my body’s position, whether I am moving or still.